Every time I connect the autoplunger , the fuse burns (f21). I changed the coil (23-800) , I put and new cable from the coil to the board and then again the fuse burned. What shall I do? Did you replace the coil with one with a diode fitted across the terminals? If not OR if you fitted the coil the wrong way round you may have blown the transistor that drives this coil. A diode needs to be fitted across the terminals and the larger wire(s) which provide the power must be connected to the tab of the coil that is next to the BANDED end of the diode. If that is all good and the coil locks on, then Change the transistor on the circuit board that is driving that coil. If you fitted it the wrong way round with a diode fitted then the diode will be blown short circuit and need to be replaced, wiring corrected and if the coil then locks then replace transistor. No. 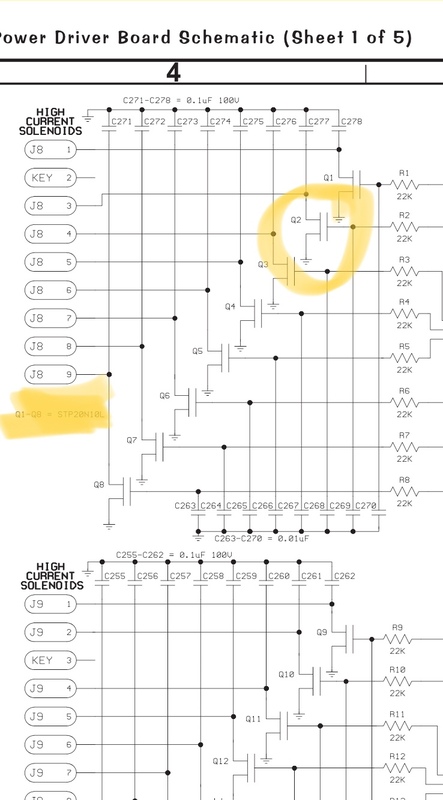 its a MOSFET 20N10L originally. It can be replaced with IRL540N or 24NF10 amongst others. Only attempt to replace it if you are sure it is short circuit and you have checked everything else is correct. If the coil is good and wired correctly then if the transistor is short the coil will lock on before blowing the fuse. Yes. Find the transistor that drives Solenoid 2 which is the auto launch. so the transmitter stp20n10l is same for replace with IRL540N or 24NF10 ?